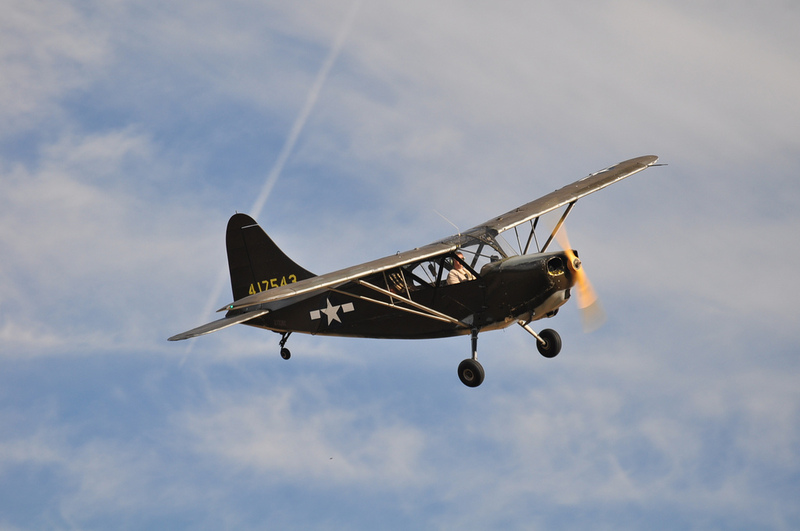 I thought there would be some interest in my family's 1944 Stinson L-5E 44-17543. 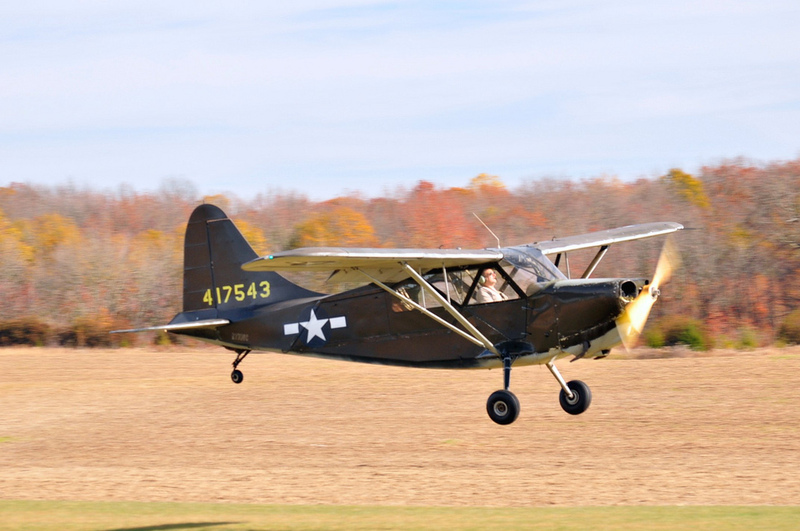 Our Stinson was built in late 1944 at the Wayne Michigan plant of Stinson Division, Consolidated Vultee Aircraft Corporation. Very soon after, it was modified with radios and delivered to an overseas shipping depot. The aircraft made it to ETO by March/April 1945 (not sure when exactly) and was assigned to Army Ground Forces (AGF). It came back in September 1945 with several hundred hours on the airframe, and was assigned to Fort Bragg and the 82nd Airborne Division, then soon after the 4th Signal Battalion (attached to 82nd Airborne Division). From there, it went to Pyote Army Air Field where it was mothballed. Called up again for Korea, the aircraft was then sent to the Civil Air Patrol and stayed there until 1956 when it was given by the USAF to the Des Moines Iowa school district for an Airframe and Powerplant (A&P) course. From there, it bounced from owner to owner when it was restored over a 9 year period from 1990 to 1999. We purchase the aircraft in 2003, just before I completed my private pilot instruction. I started flying it in late 2004 and have amassed almost 130 hours flying it. The aircraft flies hands-off, and has a nice clean break on stall as long as you keep the ball in the center. If you are flying out of coordination, It will drop a wing and recover well without spinning due to the leading edge slots forward of the ailerons. The ailerons roll down 20 degrees to give you additional drag and lift with the 45 degrees of flaps. This allows you to touch down in the low 40's or 50's MPH. On take-off, the elevator has authority before the rudder, so keeping the tail on the ground for as long as possible keeps you out of trouble in cross-winds. In landing, it will cleanly three-point but a full stall firmly planting the main landing gear is preferred and is easier than a greased-on landing due to the heavy oleo struts supporting the landing gear. Fuel burn plan is 12 gallons an hour, but you can get away with 10.5-11 gph on cruise with leaning and judicious throttle use. Maintenance is straight forward, but the tail wheel can be tricky to keep working if you don't have experience with it. The main wheels are bolt-together halves that need to be checked prior to each flight due to ease of separation if the bolts come loose. Engine parts are getting harder to come by, and detail-finishing the aircraft auxiliary components can be expensive. Wings are wood and need to be properly restored- half of all L-5's had animal hyde glue and this deteriorates over time. Many of the surviving L-5's have combat history like mine. They were primarily used in Army Air Force Liaison Squadrons which were assigned to Army, Army Group, and Theatre Command level and USN/USMC Observation Squadrons (VMO). Additionally, by the end of WWII each Division Artillery section had 1 or 2 L-5's; that's probably where mine was. While the last 2/5 of L-5 aircraft were built as ambulances like mine, they weren't used for that in ETO until very late in the conflict. In CBI and PTO that is different- over 1000 casualties were evacuated by L-5 on Okinawa and the majority of these were flown off rice-paddy dikes only 2 feet wider than the gear track of the aircraft with ZERO accidents. If you have questions/comments about the aircraft, post them here and I'll try to answer them as appropriate. The below photos are courtesy of Bill Dougherty and Massey Air Museum www.masseyaero.org. I am particularly proud of the last one- perfect three point attitude and I'm flying it! Beautiful aircraft with a nice history - it must be a joy to fly. Is the interior, particularly the instruments and panel original? How many hours on the airframe now? What is it like for short field landing/take off? I'm not so sure about the last photo - looks like you are just in the middle of a bounce! Just kidding . Tail draggers are so rewarding/fun when things go right and a challenge/disaster when they don't. That is a gorgeous aircraft. I wish I had the time and money to do something like that. Fantastic! COuld you post some interior shots, looking front and back? Here is some footage of US liaison aircraft in WW2, Stinson L-5s and piper L4s. Of interest is the use of a Brodie Device which allowed aircraft to take off and land from suspended lines hung from ships. Very nice machine! 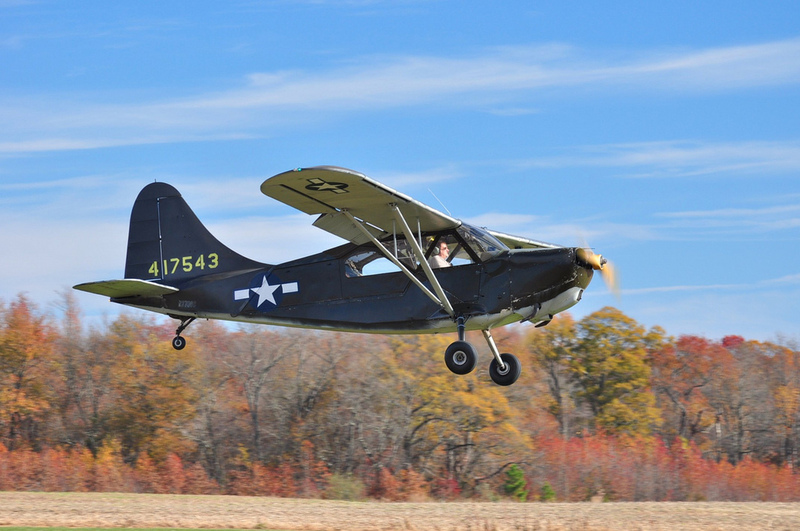 I'm a tailwheel enthusiast myself, having started out on a 1947 production Cessna 140 myself back in the early '80s (prior gilder dual and Observer time from my CAP Cadet days back in the '70s). 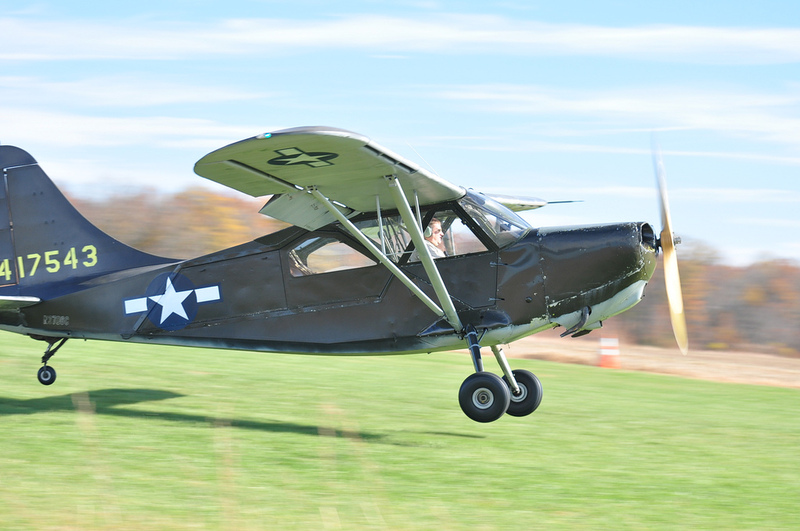 I've flown mostly Champs, Taylorcrafts and Cubs as far as tailwheels from that era go -- as well as a limited amount of time on BT-13 and AT-6 trainers -- but have yet to fly a Sentinel. As an aerospace physiologist and a commercial pilot, my chief interest in WW2 era Medical Department related re-enactment is the Aeromedical Evacuation roles carried out under ATC and Troop Carrier, as well as Flight Surgeon support to those commands. In one of my spare-time projects, I'm currently working on a multiple-generation novel whose genre is a fusion of alternate history and science fiction. Where those two angles come into play within the story lies in the portrayal of several Axis scientific developments as progressing much further (and much sooner) than actually occurred. One of the older first-generation characters is portrayed as a man who, having come of age during the so-called "Golden Age of Aviation", built and flew his own primary gliders while going to high school in the "Roaring '20s", earned a reserve commission through the old CMTC program during his undergraduate years, then went on to med school, all the while continuing to fly during his limited spare time. Eventually, he transfers his reserve commission to the Medical Corps several months after finishing his residency during the late '30s. He qualifies as Flight Surgeon during the tail-end of the interwar period, still in the reserve, later managing to obtain the additional aeronautical rating of Service Pilot (the guys with the "S" wings) when that rating was created in early '42. Assigned to a Combat Glider School at first, he temporarily sets aside his shingle as a doctor, immersing himself in the role of staff pilot and glider instructor. He finagles a transfer to the 435th Troop Carrier Group shortly before their ferry flight to the ETO and we eventually find him in the right-hand seat of a C-47 dropping troops into Normandy and on the ground at "Burp Gun Corner"! The main adventures (and misadventures!) begin shortly after VE Day when he and several compatriots find themselves re-assigned to AAF Air Technical Intelligence. The science fiction and alternate history elements come into play within the story at that point. Additionally, one of the other principal characters is portrayed as a Liaison Pilot who flew L-5s in CBI during the war.